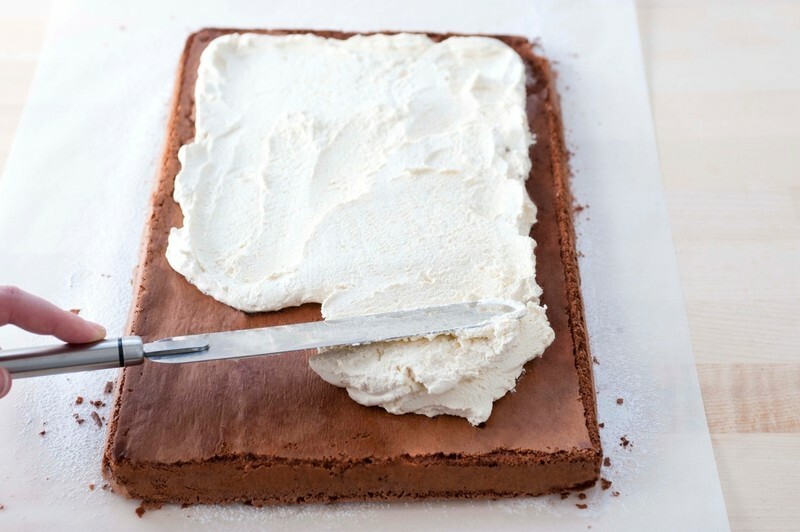 This is one of my all-time favourite, make-ahead party desserts. It freezes beautifully (un-iced), then you simply thaw it in the fridge overnight and drizzle over the icing just before serving. Posted by DK Books • Published 26th October 2014 • See DK Books's 59 projects » © 2019 Mary Berry / DK Books · Reproduced with permission. 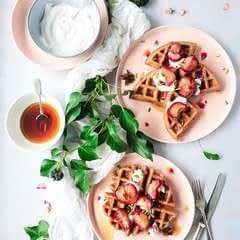 · Mary Berry Cooks the Perfect, published by DK, £25, dk.com. Also available to download on iBooks. Preheat the oven to 180oC (fan 160oC/350oF/Gas 4). Lightly grease the Swiss roll tin with butter and line with baking parchment. 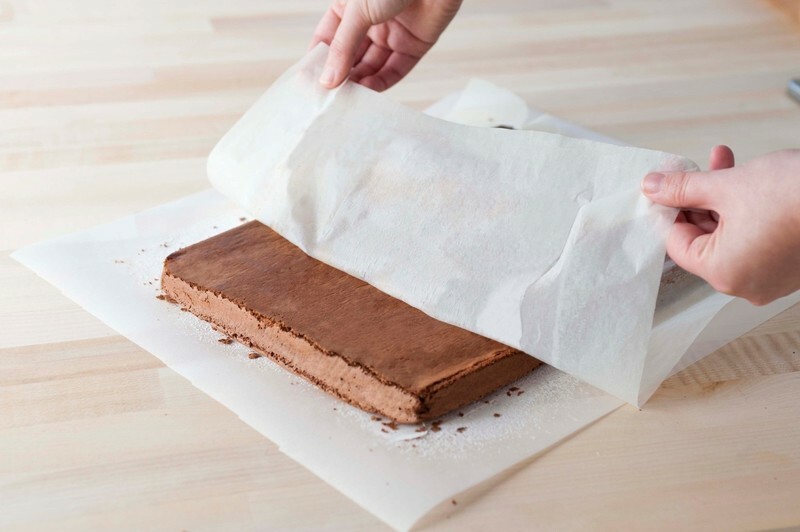 It helps to make a small diagonal snip in each corner of the baking parchment, about 3cm (11⁄4in) long, so the paper fits snugly into the corners of the tin. 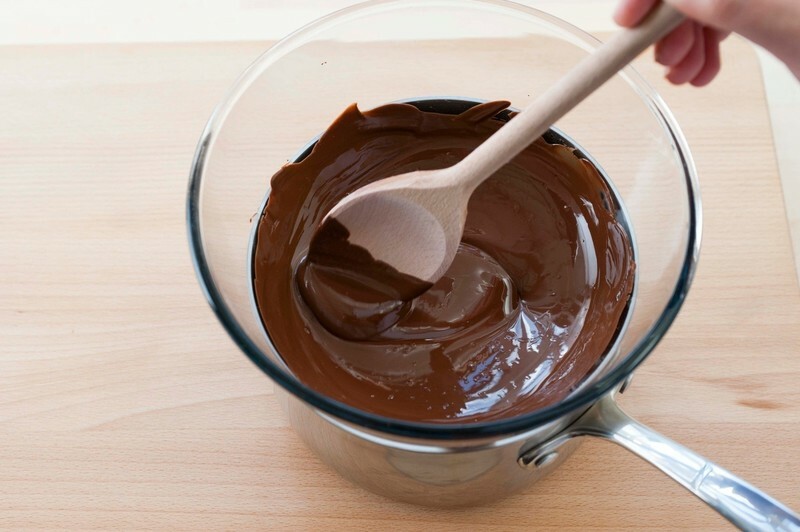 Break the chocolate into pieces and place in a heatproof bowl set over a pan of gently simmering water. The base of the bowl must not touch the water. Leave until just melted, then remove from the heat, stir, and leave the chocolate to cool slightly. Tip the caster sugar and egg yolks into another large bowl and whisk on high speed until light, thick, and creamy, for about 1 1/2 minutes. Pout in the cooled chocolate and stir until blended. Add two large spoonfuls of the egg whites to the chocolate mixture and mix gently, then fold in the remaining egg whites. Sift the cocoa and fold it into the mixture. Pour the mixture into the prepared tin and level the surface. so the chocolate doesn’t overheat, or it will become too stiff; it needs to be a pourable consistency. Stir, lift the bowl off the pan, and leave the chocolate to cool until it feels tepid. If the chocolate is too hot when stirred into the egg yolks, it will start to cook them. 2. 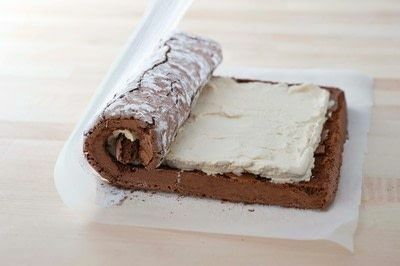 Pour the cake mixture into the buttered and lined Swiss roll tin. The mixture should be light and airy now that the egg whites have been added. 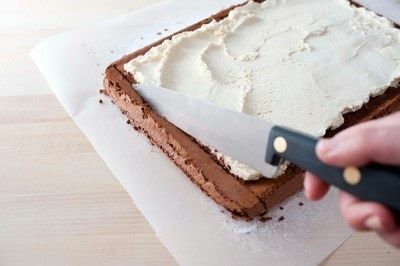 Ease it into the corners and smooth the surface level using a spatula. Do this very gently, so that you don’t squash out the air you have just whisked in. Bake for 20–25 minutes or until the cake is well risen and firm on top. Remove the cake from the oven and set aside, leaving it in its tin, until cold (expect it to dip and crack a little). Place the cream in a bowl with the Baileys Irish Cream liqueur and whip until thick enough to just hold its shape. If insufficiently whipped it will be too runny to spread; if over-whipped, it will become too thick to spread evenly. Lightly dust a large piece of baking parchment with icing sugar. Turn the cake out onto the parchment and carefully peel off the lining paper. Spread the surface of the cake with the whipped cream, leaving a bare rim of about 2cm (3⁄4in) all the way around the edges. With one of the short ends near you, make a score mark 2cm (3⁄4in) in from this edge, being careful not to cut right through. 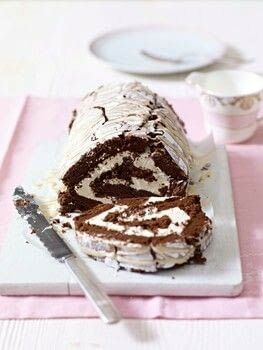 Starting at this point, tightly roll up the roulade. Transfer the roulade to a serving platter or board. 1. Leave the roulade cake to cool completely before you tip it out of the tin. Run a small palette knife around the inside of the baking parchment in the tin to loosen the cake, so you can turn it out easily without it breaking. 2. 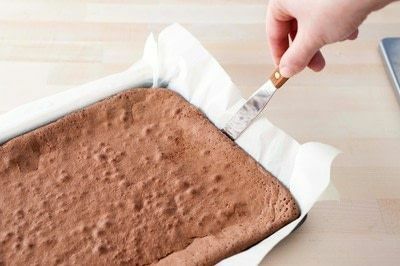 Gently turn the cake out onto a large sheet of baking parchment that has been lightly dusted with icing sugar. 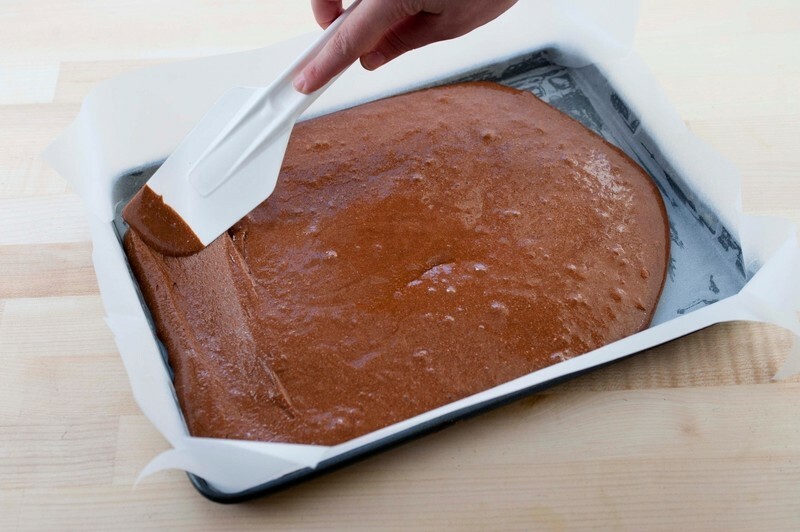 Carefully loosen the parchment that surrounds the cake and peel it off, making sure you don’t take the cake with it.